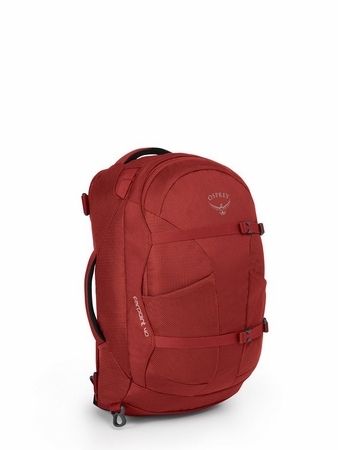 "Osprey’s Farpoint 40 is perfect for a weekend getaway in the city or the wilderness. The LightWire™ frame suspension transfers the load from harness to hipbelt. A mesh backpanel improves ventilation and the mesh on the harness and hipbelt reduces chafing under load. The entire suspension stows away under a zippered panel creating a sleek silhouette for transport. 2319 in3 / 38 L | 20h x 14w x 8d in. | 3.11 lbs "